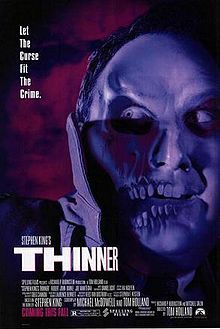 Thinner is a 1996 body horror movie based on the Stephen King novel of the same name, which was directed by Tom Holland, who brought us the beloved classics, Fright Night (1985) and Child’s Play (1988). On paper, King and Holland is like a match made in horror heaven, but critics weren’t too kind to Thinner; many felt it was too immoral, for a start. Whereas others felt it was a great idea with poor execution like much of King’s big screen translations. Furthermore, the fact that every character was a horrible human being didn’t sit too well with those looking for someone to root for. What’s wrong with movies about awful people doing awful things to each other? Don’t you like it when the bad guy wins? I sure as hell do; especially when it’s as entertaining as this baby. 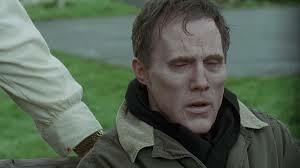 Billy (Robert John Burke) is an obese attorney who specializes in protecting his towns small time mafioso from going to jail; not that he needs to do anything as the law and judge are all corrupt. One night, while driving home, his wife decides to give him oral pleasure, and while distracted, he hits an old gypsy woman and kills her. Dead. Not coming back. His case is quickly dismissed, causing the gypsies to deliver their own brand of ”gypsy justice” in the form of a curse that causes Billy to rapidly shed pounds until he wastes away completely. How will Billy get out of this pickle? Hope the sookie sookie was worth it. Let’s be honest: Billy deserved to be cursed. Not only did he run over an old lady, but he never showed any remorse for his actions because he knew he was getting off. 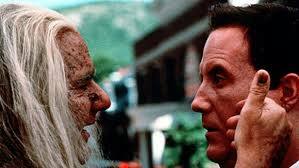 Thinner had all the makings of a morality tale where Billy showed remorse for his actions. But he’s a lawyer, and the message is lawyers are evil men who are above the law. So, instead of accepting his fate, Billy hires his mafia pals to threaten the gypsies with violence in order to remove the curse. For Billy to break the curse, he must pass it on to somebody else by having them eat a pie with his blood in it; a morality tale it is not, but an entertaining piece of mean spirited pie it most certainly is.